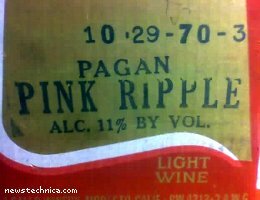 Pagan Pink Ripple Alc. 11% by Vol. by rochelle, et. al., CC by 2.0. Vintage April, aged by truck, for some truly remarkable visions both the night before and the morning after.